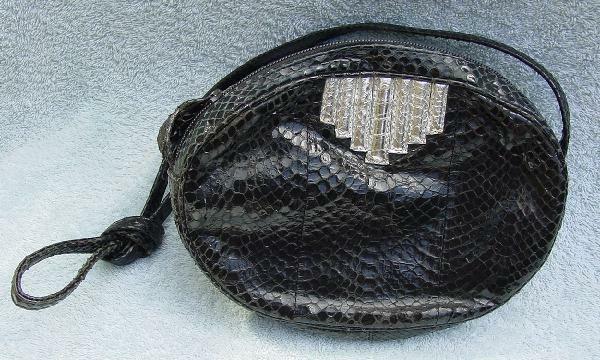 This vintage oval black snakeskin purse is by Mary Ann Rosenfeld. 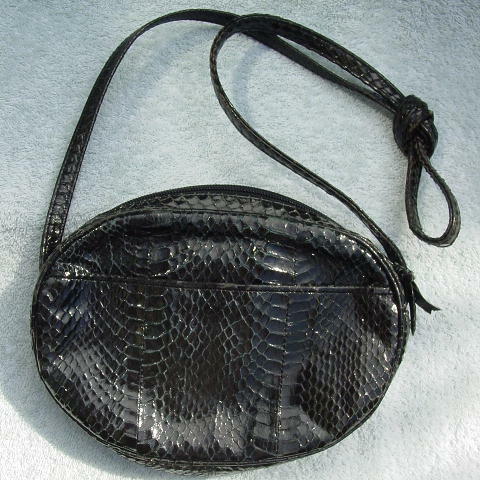 It has a top side to side zipper with a snakeskin strip pull and a 32" long strap which has been knotted. It has been knotted for so long that some of the scales have worn off that part of the strap in the knot. Some of the scales are missing from the bottom, front, and back of the purse. It has a silver lame column design on the front in the center below the top rim. The back has an exterior side to side open compartment, with some scales missing on the rim. The interior has a thick black vinyl lining and two roomy inner compartments, one open and one that has a zipper. The zipper compartment has a black fabric lining, and above it, a gold-tone metal tag that says Mary Ann Rosenfeld. It's still a charming purse. It belonged to a former German model.